Although the New Yorker magazine is my favorite source for a lengthy exposé on a hot topic like Scientology, informational pieces on the internet, or to get the back story on a famous person – and, of course, the cartoons – I usually steer away from the short stories, unless I recognize the author: Tom Wolfe, Allegra Goodman, Jonathan Franzen. Most times, the editor’s picks are too modern, too high brow – just not fun to read. So, it was with some trepidation that I started the collection of Ann Beattie’s short stories from the New Yorker. Praised as a new writer of the seventies who has endured, Ann Beattie has had more short stories published in the New Yorker than probably any other writer – but I had not read any. 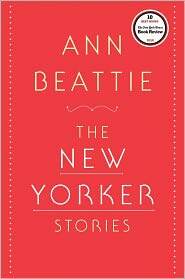 Ann Beattie – The New Yorker Stories in a bright red cover has every one of her pieces published in the New Yorker (48), spanning from 1974 to 2006. I sampled a few from different timelines, and will probably go back now and then to read more. The Table of Contents included the dates of publication; her stories from the seventies reflect the angst of her baby boomer generation, who were trying to figure out what to do with their lives, and expecting a lot. In “A Platonic Relationship,” (April, 1974) the first story in the collection, Beattie examines Ellen, a thirty-something music teacher and her relationships with the husband she is divorcing, and with Sam, the twenty year old college student, who comes to live with her – first as a roommate, eventually as her lover. As Ellen tries to cope with her loneliness, Sam offers friendship and validation, giving her renewed confidence. Her mood dips again when Sam leaves (on a motorcycle), but in the end, she finds her level of peace with herself and her ex-husband. In “Wolf Dreams,” (November, 1974) Beattie tackles the hunger of a woman perpetually on a diet, who convinces herself to lose twenty pounds before marrying her third husband. When she meets a stranger on a train, his comments drive home her sad ambivalence and low self-esteem. Like her other stories, these have only minimal information about the characters, yet they are clearly New Yorkers. It’s up to the reader to fill in the blanks. I skipped over the eighties and the two stories from the nineties to this century. As expected, Beattie has followed her generation and now writes of their current issues. In “The Rabbit Hole as Likely Explanation,” (April, 2004) Beattie made me laugh, despite the theme – the character’s mother has Alzheimer’s. The fast-paced conversation between mother and daughter has all the elements of farce, yet the banter is poignant. The family members trying to cooperate and cope – the inevitable tensions and mixed messages – the selfishness, the quest for normal – whatever that is – all wrapped in a short story. I need to read more stories, but so far, this one is my favorite. Reading some of Ann Beattie’s collection has not changed my mind about New Yorker short stories. They are still not the ones to pickup when up when you need a short break from a novel. Rather, they require all -maybe more – attention than a quick read, and it’s hard to read more than one is a sitting. Beattie can tell a lot in 10 to 20 pages, but it takes a while to digest her words. This entry was posted in authors, book review, books, reading, short stories and tagged Ann Beattie, New Yorker, short story. Bookmark the permalink.